Applications of combinatorial synthesis and characterization methodology to electronic, magnetic and smart materials; fabrication and characterization of novel multilayer thin-film devices; variable temperature scanning probe microscopes. We have developed a comprehensive methodology for rapid mapping of previously unexplored compositional landscape in search of novel multifunctional materials. A variety of thin film deposition tools are implemented for synthesis of combinatorial thin film libraries and composition spreads of various designs. A suite of rapid characterization tools are utilized for quantitative mapping of relevant physical properties across combinatorial libraries. These include microwave microscopes, a scanning magneto-optical Kerr measurement setup and scanning x-ray diffractometers. Current topics of interest include magnetistrictive materials, multiferroic materials, and shape memory alloys. Our recent emphasis has also been on development of informatics techniques to effectively handle, visualize, and analyze the large amount of data which are generated from the combinatorial experiments. We have a network of international collaborators with whom a number of combinatorial experiments are carried out at any given time. Previously I had worked on fabrication and characterization of superconducting thin film devices for over 10 years. My interest in novel functional devices now spans a range of other materials including magnetic materials and various smart materials. Our current projects include various multilayer multiferroic devices. Many of the rapid characterization tools used for screening combinatorial libraries are scanning probe microscopes. For instance, we work extensively with scanning SQUID microscopes (in collaboration with Neocera, Inc.) and scanning microwave microscopes. We have recently demonstrated high sensitivity scanning magnetic probe microscopy using a magnetoelectric device. Our current project includes development of novel microwave microscopy combined with atomic resolution STM for performing spin resonance measurements. Made of Star Stuff - PhD Student Justin Pearson, advised by Prof Takeuchi, discusses his thin film research. Robot (Materials) Science: Can Watson Beat Edison? Dwight Quench: We have developed a technique where an entire thin film on a wafer can be quenched from a high temperature. In the movie, a thin-film composition spread wafer mounted inside a narrow high-vacuum chamber pumped by a cryopump is annealed in a furnace at 800 C. For quenching the wafer, it is “quickly” pulled out of the furnace, and the chamber is dunked in an ice bucket. This results in formation of quenched thin film phases as reported in Ref. 102, Applied Surface Science 254, 725 (2007) and Ref. 147, Nature Communications 2, 518. FeCoNi XRD contourslices-2: Visualization of X-ray diffraction patterns from the entire Fe-Co-Ni composition spread. The big triangular shaped blob corresponds to the main fcc peak showing significant shift as a function of composition. The thin oval blob near the Fe end is the bcc main peak. Shown on the cover of Ref. 95. IchiroCombi with Targets: Combinatorial pulsed laser deposition of epitaxial oxide thin films. The movie shows the synthesis process of an epitaxial composition spread onto a heated substrate. Two targets (with end compositions) are used to deposit alternating ultrathin gradient thickness wedges using a synchronized moving shutter gliding over the substrate. The thickness of the wedge is designed to be less than a unitcell. The deposition of hundreds of wedges results in mixing of the end compositions at the unitcell level during the deposition at an elevated temperature. The composition continuously varies on the substrate from one end composition to the other. Each composition spread sample is roughly 7-10 mm long. This technique is used for continuous substitution experiments. See for instance, Ref. 71,72, 85, 100. XRDSuite: demo of early combinatorial X-ray diffraction data visualization and analysis tool. One can see a large number of diffraction patterns in a number of different ways. NiMnAl – Sepctrum Scroller: Another demo movie of XRDSuite. NiMnAl – Peak Plotter (Full Spectrum with Mag): Comparison of diffraction patterns of Ni-Mn-Al composition spread and magnetism. With one look, one can see which diffraction peaks (and phases) are responsible for the composition regions with strong remnant magnetization (measured by scanning SQUID). Demo of CombiView: software to carry out rapid visualization and cluster analysis of a large number of diffraction patterns taken from combinatorial libraries. Professor Ichiro Takeuchi uses machine learning to help develop new magnetic materials. Both students are 2018 A. James Clark Fellowship recipients. Center will bring together experts from multiple Universities, including MSE's Ichiro Takeuchi. Device will have broad application, from cooling laptops to treating epilepsy. Professor Takeuchi was honored at a ceremony on September 12. Awards ceremony on Wednesday, September 12 @ 3:00 pm. Discovery presents a significant step toward lower fuel cell costs and more sustainable energy. Fellowships of $25,000 each help fund the students’ research. A group of UMD researchers has found a novel way to send a supercurrent through the surface of an insulator. Professor Robert M. Briber named Clark School Associate Dean for Research. DURIP grant funds new instrumentation in Combinatorial Synthesis Lab. UMD wins one of six computational design toolkits from ASM International. Office of Technology Commercialization to announce winners at the Celebration of Innovation and Partnerships, April 29. Jason Hattrick-Simpers (Ph.D. ’07) is a professor of chemical engineering. Nagarajan Valanoor (Ph.D. '01) honored at recent ceremony. Fackler’s exploration of vicalloy using combinatorial materials synthesis wins awards. Nagarajan Valanoor recognized for work in ferroelectrics. 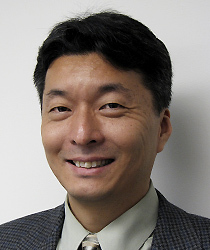 Takeuchi brings expertise in combinatorial materials science to fuel cell team. Technology developed in the Clark School could power more efficient air conditioning. Hattrick-Simpers reports new strategy for preventing oxidation and waste. Division of Research honors faculty for funded research. Department of Materials Science and Engineering professor honored for transformational research in his field. Research teams at UMD receive grants for multidisciplinary research initiatives. Professor's 80th birthday, career celebrated in special symposium. Professor Nagarajan Valanoor (Ph.D. '01) recognized for excellence in mentorship. Takeuchi leads team creating solid-state, highly efficient cooling systems. Electron Microscopy Inspires Flexoelectric Theory Behind "Material on the Brink"
Takeuchi, Oak Ridge National Laboratory make new discoveries about unique, lead-free piezoelectric material. Center for Neutron Research highlights work on multiferroic epitaxial films. Alumnus, former Sloan Scholar recognized as "resilient member of NACME Continuum." Jason Hattrick-Simpers (Ph.D. '07): Department of Chemical Engineering at the University of South Carolina. Researchers report discovery of new magnetostrictive material. Presentations covered fuel cells, storage, reclaimed waste heat, thermoelastic cooling. Compact, efficient, environmentally friendly cooling system takes top honors. Cited for pioneering work in combinatorial materials science. Briber leads effort to develop new instrumentation, measurement techniques. Ruhr University partnership generates new research, exchanges students and faculty members. $500K DOE ARPA-E grant for groundbreaking energy research. Departments of Defense, Energy fund $15M "combi" studies on superconductors, magnets. Takeuchi Group member works on novel ferroelectric materials. DOD award will fund new equipment and support defense research. Faculty honored by university for bringing substantial sponsored research funds to campus. Takeuchi, collaborators developing ultra-sensitive devices for threat detection, biomedical applications. Rubloff, Takeuchi discuss environment- and energy-related research. Medical Device & Diagnostic Industry features work on lead-free piezoelectric. New rank effective July 1, 2009. Professor featured on national syndicated news service. Award is 3rd received for work on data mining of combinatorial x-ray data. Research will include work on nanoparticles, nanowires. Clark School engineers discover new material to reduce lead in electronics, landfills. Briber, Phaneuf, Rabin, Rubloff, Takeuchi and Wuttig honored at luncheon. Lead-free piezoelectric material discovered with combinatorial thin film strategy. "Frontiers of Engineering" targets exceptional young engineers. Research will lay foundation for discovery of new hydrogen storage materials. Doctoral student recognized for work in combinatorial materials science. TEM and STM/microwave equipment will enhance research abilities. Takeuchi Review Makes Cover of "Materials Today"
Combinatorial materials science is cover story. Award given for their work in advanced visualization and analysis techniques of X-ray microdiffraction data.